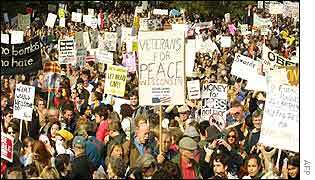 Tens of thousands of people have marched in the US cities of Washington and San Francisco as part of a day of worldwide protests against a possible American-led war against Iraq. 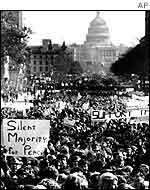 A number of other US cities saw demonstrations, while protest rallies also took place in Mexico, Japan, Spain, Germany, South Korea, Belgium and Australia. In the US, the protests are being hailed as some of the largest in the country since US citizens took to the streets in the 1960s and 1970s to protest the Vietnam war. Waving banners and chanting slogans, the protesters called on the US president to abandon plans to topple the Iraqi leader, Saddam Hussein, and to spend the billions of dollars needed for a military campaign on social programmes instead. The US Congress has granted George W Bush the power to wage war on Iraq - with or without the approval of the United Nations. The protests took place as US Secretary of State Colin Powell said the protracted negotiations at the UN over the adoption of a resolution on Iraq must move forward; t the organisation was entering a key week and could not continue to hold a never-ending debate. "It is time to bring the remaining issues to a head for resolution, if possible," he said. "And if resolution is not possible, then let's come to that realisation and move forward." The rally in Washington opened with speeches at the Vietnam Veterans Memorial from celebrities such as musician Patti Smith and actress Susan Sarandon. Palestinian and Moslem groups also attended the march, along with veteran civil rights leader Jesse Jackson. "If we launch a pre-emptive strike, we will lose all moral authority," he told the crowd. "We must have a higher order than a one-bullet diplomacy." Jackson said. Elsewhere, in San Francisco, around 5,000 people, including several Palestinian pressure groups, converged on City Hall to hear speeches. Germany was the scene of some of Europe's largest protests, with more than 80 cities holding rallies. The Federal Peace Committee, which helped organise the protests, told French news agency AFP that up to 10,000 people attended Berlin's rally. 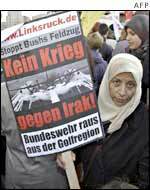 The marches come after an opinion poll conducted for the New York Times and CBS News earlier this month suggested that half of those questioned in the US were uneasy about the prospect of war with Iraq. Supporters of the march also point to successful internet fund-raising and letter-signing efforts as signs of the support for their cause. Bob Edgar, general secretary of the National Council of Churches and a former Democratic congressman from Pennsylvania, said he remains optimistic that war can be avoided. "I don't think that, just because the House and Senate voted, that the barn door is open and we're going to have war," he said. The US is pressing the UN to accept its resolution on disarming Iraq. But it is encountering resistance from Russia and France, who can both veto the resolution. Mr Bush on Saturday reiterated his vow that the US would use force against Iraq if Saddam Hussein did not disarm, whether or not the UN supported such action. "If the UN won't act, if Saddam Hussein won't disarm, we will lead a coalition to disarm him," he said. I heard the previous story over the BBC World Service. Found the written story on their web site. B) listed under "National" news.